In early July in Pamplona, Spain, during the 9-day San Fermin Festival, they run the bulls through the streets of the town for a few mornings. A crowd of human daredevils joins the run. Inevitably a few people get gored by the bulls. A half dozen of the bulls get killed later in the afternoon. This year one of the idiots who got gored by a bull was an American writer, Bill Hillmann, 32, from Chicago. 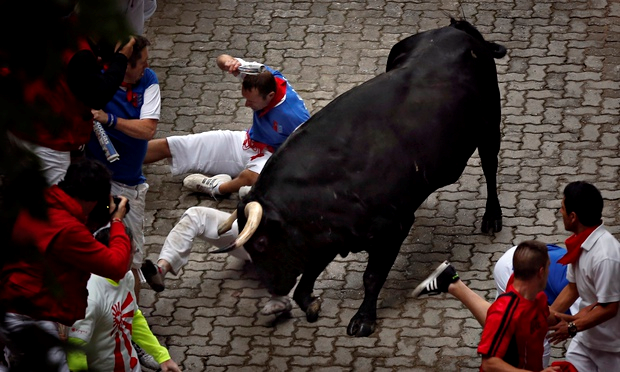 He’s the co-author of, you guessed it, Fiesta: How to Survive the Bulls of Pamplona. Jeez, the things they make writers do for book publicity these days. Mr. Hillman is reportedly recovering in hospital from his “serious, but not life-threatening wounds.” We wish we could say the same for the bulls.